Ever since I found out I was pregnant (which was very early on), I knew I wanted to write about wearing hand-made throughout my pregnancy. I wanted to see how much I could mix up the hand-mades I already have (and make them last as long as possible! 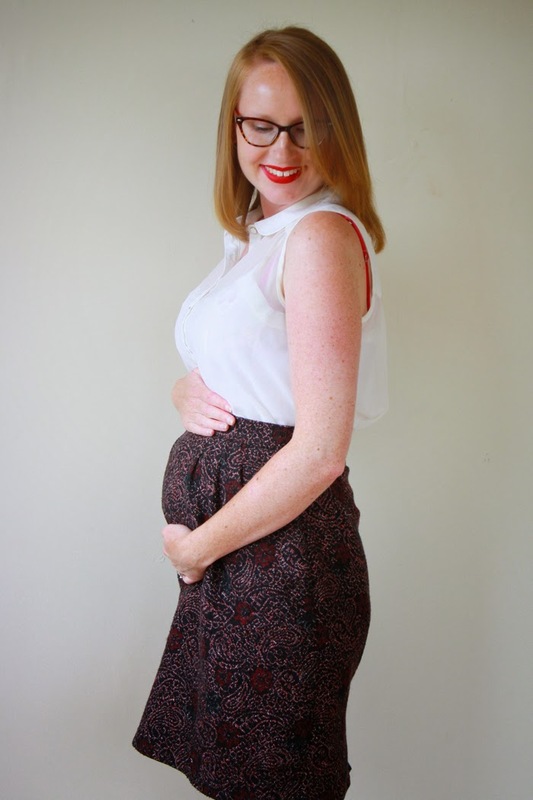 ), as well as adapt patterns I already have into maternity-friendly clothing. I wear hand-made virtually everyday and thought that being pregnant shouldn't make it any different, it's just a bit more challenging. You see, I've entered into a whole new target market now, and it seems to me, that just like the words 'wedding' or 'bride', as soon as you put 'maternity' or 'baby' in front of a product, it's all of a sudden worth five times as much as it was before. Think wedding cakes, bridal hair or wedding flowers - they all of a sudden cost so much more because they are specifically for a wedding. Well, babies and maternity seem to be no different from what I've spied. Take an empire waist, stretchy jersey dress (what looks to be a pregnancy staple) - you can find these kinds of dresses in just about any department store for cheap as chips. But as soon as you go looking for the same thing in a specialty maternity store, or the maternity section of a shop, they're all of a sudden worth so much more than they were before. Like most people, we're on a budget, and luckily I know my way around a sewing machine so I'm going to be making much of my maternity wardrobe, even though I'm a self-confessed disliker of making 'specialty clothing' or clothes that will only be worn a handful of times. With maternity, while they aren't exactly frou frou party dresses I'll never wear, there is technically only a limited amount of wear you'll get out of them. In saying that, I love wearing hand-made and I love that I can make something specifically to fit me and my needs, so I'm diving in head first - with lots of ideas for a budget-friendly, stylish and practical hand-made maternity wardrobe, coming right up over the next few months. So, this week, week 20 and officially half way through, what am I wearing? I'm not into full on maternity clothes yet and can still fit into a reasonable amount of my current hand-mades, despite my slowly northward-travelling waist line. 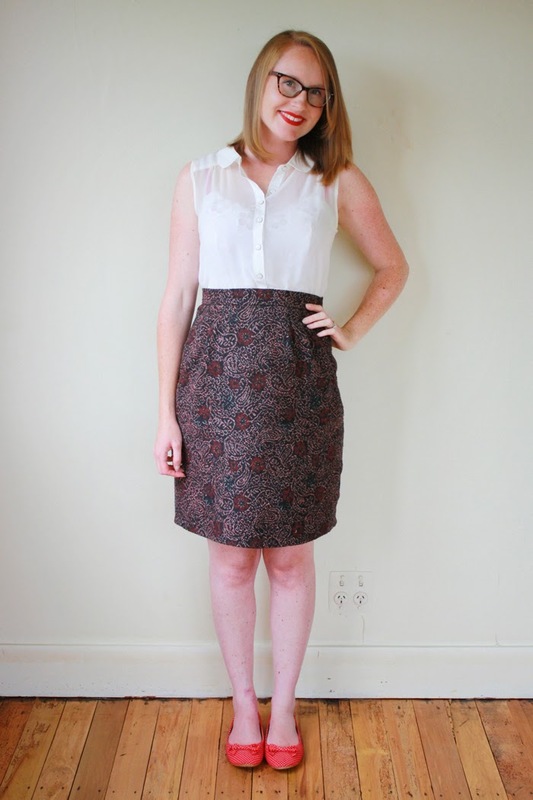 The skirt I'm wearing is one of my absolute favourite hand-mades, that I never blogged about. I know, I can't believe it *face palm*. I wear it probably at least once a week. It's a self-drafted pencil skirt with pleats at the front (perfect for a growing stomach or hiding a big lunch) and a little kick-pleat at the back. It's made from wool, is fully lined and is the perfect mixture of colour and pattern to enable me to wear it any number of different ways and not get bored. It also doesn't need any ironing, even after living on my floor for a few days - I can just pick it up, put it on, and head out the door, no fuss. The day I can't do this skirt up anymore will be a sad day indeed, but here's a little secret - if it's a particularly cold day, throw on a long/loose cardigan and undo the button at the back. Nobody will be any the wiser, and I have done this a few times in the evenings when everything has just felt a bit too tight after dinner. If you wanted a bit of extra security, instead of buying one of those 'specialty' stretchy bands that allows you to wear your favourite jeans, but with the button open and zip down, why not try a hair elastic instead? Does exactly the same thing, and you probably already have a million hiding around the house, hanging out with those dust bunnies and bobby pins under your bed (just me then?). 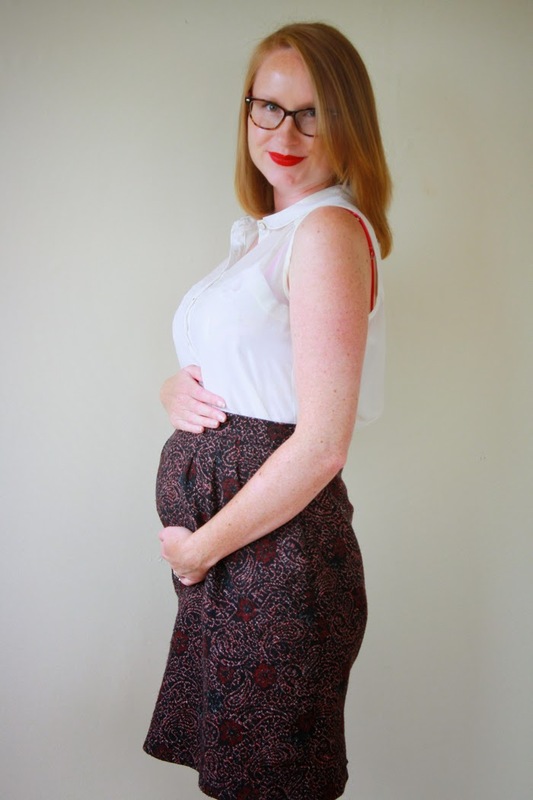 20 comments on "Me Made Maternity - Week 20: If the Skirt Fits..."
Congratulations on your pregnancy, this is such an exciting time! I'm not sure this is your style, but I always wear quite smocky, shirt type dresses normally and found these brilliant for pregnancy and after. Comfy for the later stages and after the baby is born when you just want to chuck something on. They are also great for breast feeding if they have a button front (if you're going down that road), which by the way, throws up a whole load of new wardrobe issues. Good maternity choices can see you through pregnancy and beyond!!! Thanks Marilla :) I am thinking about a smock/shirt-waist style that I can belt up over the growing belly, so yes, a great idea! Thanks Colesworth :) I love this skirt. I'm all about the hair tie trick! That got me through both my pregnancies. Also they sell these tummy bands that basically make it look like you have a longer singlet under your top. They're just a strip of material sewed into a tube. You could make those super easy! If your interested in the Megan Nielsen maternity skirt pattern let me know. I have a copy that I won't be using again. I can send it to you. Hey Kat, yay, another hair tie lady! I don't understand needing to buy a specialty item when you've already got it in your drawer, it's just called something else. And those tummy bands that are just tubes, hehe, yeah, I think they'll be pretty easy to whip up if I think I need one :) Thanks so much for the tips! Stretchy "bump bands" serred me well throughout most of my pregnancy as they cover up when your tops get too short. They'd be so easy to whip up - just a tube of stretchy knit. Katie Kadiddlehopper did a great tutorial on adding maternity top parts to existing trousers. Jersey dresses especially wrap ones work well when pregnant but also if you plan to breastfeed. I loved an empire line dress I had and a full semipleated skirt that had a wide jersey band from hips to waist. Yes, stretchy tubes are definitely on my list if I decide I need them ;) Since i don't wear pants, I'm not sure if I will, but they're there just in case. You look SO CUTE! I love this skirt on you! I feel that while maternity is a limited time, you DESERVE to have some clothes you are comfortable and feel presentable in. For heavens sake it's bad enough you are walking around with 30 extra pounds awkwardly placed directly in your front, do not feel that you need to punish yourself by economizing and not buying or sewing at least some staple items that are comfortable and as flattering as possible. If you are like most women, you'll wear many maternity items during the early months after birth, and you deserve to have some things that make you feel good about yourself. It's a major life transition, and one that can really challenge your body-image, so don't short yourself. Having nice clothing can make you feel more normal during the changes that occur. That said, two pregnancies taught me to appreciate the concept of a "capsule wardrobe." A black skirt, flat boots, and a variety of flowing tops and cardigans and blazers saw me through two pregnancies as a lawyer. I totally agree, but I always have this little niggle that if I can't see myself wearing something lots (even if it turns out I don't wear it at all!) I always question if I should spend my time making something else instead, if you get what I mean? But that's not to say that I don't think I deserve a nice maternity wardrobe, it's more that I need to think carefully about what that is made up of, so I don't end up with a huge pile of clothes I won't be wearing by the end of the year. I have cardigans and shrugs on the brain right now, so I reckon that'll be what sees me through as well. You look amazing! I hope I'll look just as put together and stylish once I have a bun in the oven. Thanks Erin!! Me too (tehee!!). Aw this is so sweet! You look great!